The cool factor is simply off the scale when you have an automatic pool pool cover however what many people do not know is the staggering benefits that an automatic pool cover provides other than just safety. The top three economic benefits are: 1.) Energy savings from keeping the pool cover closed when you heat the pool (imagine trying to heat or cool your home without a roof!). 2.) Water savings from evaporation. The amount of water that evaporates from your pool is amazing, this is all but eliminated when you have an automatic pool cover 3.) Chemical savings from evaporation. Many pool owners do not realize that the chemicals that they continuously add evaporate and this results in having to add more. So, having the coolest pool safety product in the marketplace also has some of the most outstanding benefits as well. Do you want the convenience of opening your pool without depending on electricity? We have the perfect solution. This is a manual rotation cover that allows you to open your pool in a matter of two minutes with the simple turn of a lever and it is powered by you (if the power is out, you can still access your pool) . Comes in a variety of covers,has the durability you need and provides the safety for your back yard when you have a pool. 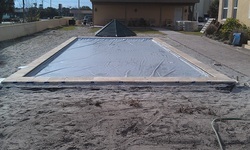 Completed automatic pool cover . A newly built pool where the house was going to be rented part of the time (seasonal) needed an easy solution for safety, keeping the pool warm and keeping debris out. 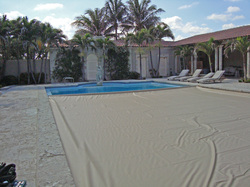 Automatic pool cover (Beige cover). As energy prices continue to skyrocket, more and more people with large pools are getting an automatic pool cover for cost containment.The average return on investment for an automatic pool cover is about 3 years. This particular automatic pool cover will provide a return on invesment in just under three years.